If you are looking for legal advice, there are numerous areas on the Internet where you can find it. For instance, if you look at the home page of PTS (this article belongs to the group of PTS sites on technology), you will find some excellent articles categorised into the legal sections, just find the ones most useful to you. This site covers acts of parliament with explanatory notes. You can download information in pdf or other formats on all the various acts, such as Public Acts, and Bills currently under review before parliament. This site provides access to the database of primary legislation in the United Kingdom. Basically, it covers all the laws of the land online. If you need to know about any topic on the law, you will probably find it here. This site is the official government website and includes information on all the public services online. Areas covered include Education and learning, Motoring, Home and community, Employment, Money, tax and benefits, Travel and transport, Health and well-being, Environment and greener living, Crime, justice and the law and Government, citizens and rights. It basically explains all there is to know about government, laws and other useful information. 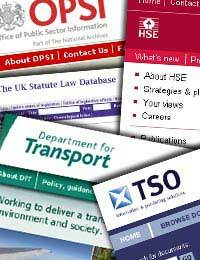 This site provides information on health and safety in the workplace, and the law as it stands in the United Kingdom. It also provides information on past disasters and the steps subsequently taken to prevent re-occurrence of the problem. The site is useful if you are interested in health and safety in the workplace and you need to find information on the topic online. Learning to drive? This site contains the official source for the highway code in the United Kingdom. You can take sample tests and study the code online, so it is always available when you need it. All you need to do is register your details, and it remembers the topics you have studied and taken the practice tests for. Nothing better to do or can't sleep? Well take a look at this site and read through a few acts of parliament and you should be asleep in no time! We may jest, but there is a lot of useful information on there and if you are a law student, then this site is a must! One of the oldest acts on there is from 1837, and is not easy reading, but you judge! This site does what it says on the tin. It's great if you are studying a politics degree or are interested in politics. You can browse through full-text of online copies of House of Commons Papers, Government Department papers and a large choice of others. It is a useful source of information if you wish to see the official documentation on any parliamentary area.